These AC dimmable power units for leading edge and trailing edge dimmers are destined for LED and illumination applications in indoor areas. 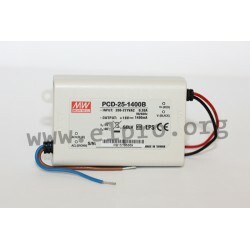 Further facilities: flexible wire terminals, constant current, built-in active PFC function, protection against short circuit, overvoltage and overload by current limiting (auto recovery). 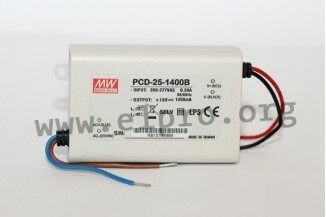 We offer the types PCD-25-350B, PCD-25-700B, PCD-25-1050B and PCD-25-1400B by Mean Well.